After thirty years of faithful service, the Space Shuttle Program has come to an end. Space Launch Complex 39 - which launched Space Shuttles, Apollo Saturn V moon rockets, and the Ares I-X Rocket - will now be silent. The two launch pads at Complex 39 - Pad A and Pad B - will now be empty and quiet... except for the people and machinery dismantling the Shuttle-specific launch towers and rotating service structures. “Immediately we began working on designing and producing a collectable that honored the entire Space Shuttle Program. Not everyone was on-board. I recall some of the early discussions that discouraged developing this commemorative. 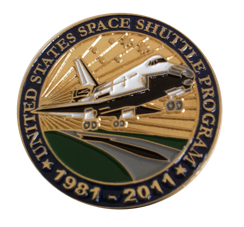 “There will be hundreds of such collectables... why should we create one too?” In spite of the nay-saying, we decided to make the Shuttle Commemorative Coin.” And to all of our amazement, to this day there is only one. “We also decided that we needed to add significant details in the design of the coin. 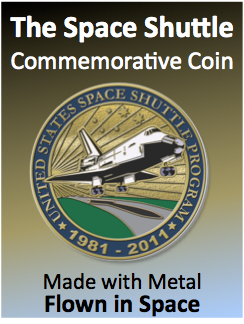 We also needed to decide which image of the Shuttle to use as the main image.” And you can read about those details (and view a short video tour of the design) at the website: www.SpaceShuttleCoin.com.